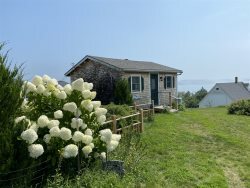 Tide Watcher 1 is a handicapped-accessible apartment in Stonington’s picturesque village. Watch the boats and the tides come and go from this nicely equipped seaside efficiency apartment. The apartment has tile floors, many new and contemporary furnishings as well as a convenient in-town location. Watch the fishing vessels, schooners, pleasure boaters, and many other vessels on this bustling working waterfront from the dining area's table for two with close up views of Stonington’s thoroughfare. The kitchen has everything you need for basic cooking, a sink, a small cook stove, and a compact refrigerator and freezer unit. Tide Watcher 1 has a queen sized bed and AppleTV to pair with your mobile device for easy HULU, DirectTV Now or Netflix streaming. The bathroom in Tide Watcher 1 is fully handicapped accessible with no step to get in to the shower and railings for steadfast support around the sink and toilet. Enjoy a small patio area with views of the thoroughfare and roadside parking space to complete this sweet and trim accommodation. Call or inquire to reserve your time in Tide Watcher 1 today.